﻿ Best Price on Cerro Azul Vacation in Cerro Azul + Reviews! 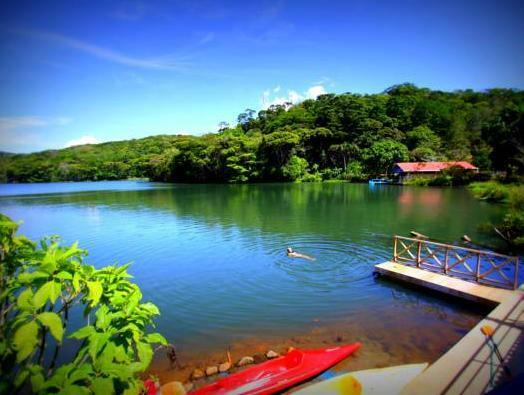 Located beside Cerro Azul Lake, these 3 spacious studios have well-equipped kitchenettes and private lakefront terraces. Surrounded by tropical rainforest, Cerro Azul Vacation offers a hot tub, free Wi-Fi and free bicycle rental. Each bright studio has a double bed and a seating area with satellite TV, a DVD player and a Nintendo Wii. Kitchenettes feature a stove, microwave and coffee machine, and terraces include a barbecue. You can enjoy swimming in the clean waters of the lake or expore the surrounding jungle. Staff at the 24-hour reception can help arrange kayaking, rafting or fishing trips. Cerro Azul Vacation is situated in the mountains just outside the Chagres National Park. Tocumen Airport is a 20-minute drive away, while Panama City is 30 minutes away.